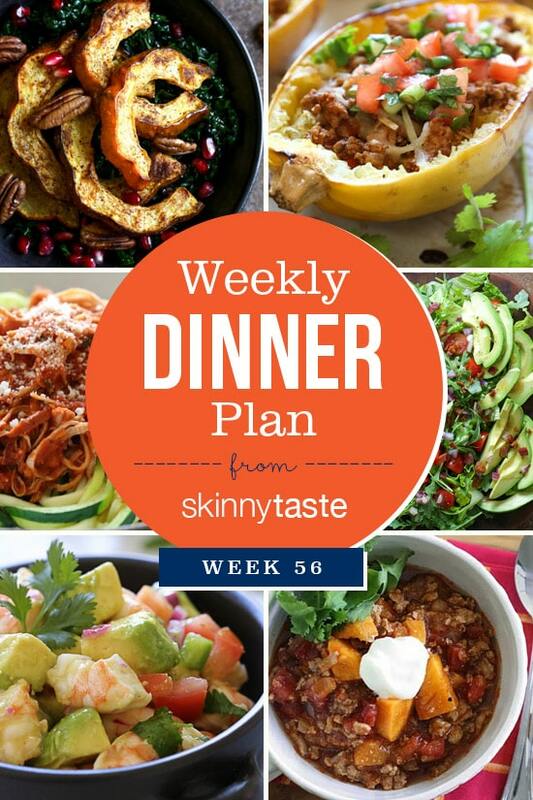 Skinnytaste Dinner Plan (Week 56). I have decided to try something a little different with our last meal plan of the year… this week all the recipes are WHOLE30 compliant. I’ve been getting tons of requests and since I have so many recipes that fit a WHOLE30 diet, which you can see here I thought I would try this for a week and see how it goes. I may do this once a month, or if you have requests for anything in particular such as a vegetarian week, gluten-free, etc let me know! For all you Weight Watchers, don’t worry I’m still eating cheese and grains and will continue to share a variety of recipes as I always do! I just started my first whole30 and have been using these recipes for dinners. Wow! My husband and I LOVED the turkey taco boats! The Kale salad with Acorn squash was a big hit too! Thank you Gina for making me love this new eating plan! Thanks, Gina!! We’re going to do our second Whole30 in January, and your site was helpful the first time around. Thanks for adding the Whole30 tag, too! You are consistently our go-to for recipes – thank you so much for everything you do!! I would like to ask a question when you use chicken broth in soups what brand do you normally use? Anytime I use one th whole soup just tasty like the broth and not very tasty. I do use low sodium. Any advice would be appreciated. Thanks and Happy New Years. Yaaaaaassss!!!! Thank you for this! I’m gearing up for my first Whole30 and am excited. It is a Christmas treat to find a complete Whole 30 week of recipes. Many thanks. Starting whole 30 again after the holidays and I will tuck this away. Gina, I’ve never commented on your blog before, though I’ve been following you for years. But now, I just want to let you know that yours is the most beautifully and consistently written healthy-food blog I’ve come across. Your recipes are, without fail, fabulous and gorgeously photographed. And I LOVE your weekly meal plans. I’ve saved every one in a folder and occasionally refer back to them for ideas. I’m an on-again, off-again WW member for several years, and even when I’m not following it diligently, you are my first source for great recipes. You clearly put your heart and soul (and countless hours) into your work, and I can’t tell you how much it is appreciated. And I’m betting there are lots and lots of folks out there just like me who just aren’t regular commenters. But just know that we’ve come to know and love you and your wonderful blog and look forward to the creative and delicious dishes you have in store for 2017. Thank you so much for what you do. God bless. My husband and I did our first Whole30 this last year and I must have made your turkey taco lettuce wraps 4 times in those 30 days! (and even after we added tortillas back in after Whole30, your turkey taco recipe has been my only taco recipe!) We’re doing our second Whole30 this coming January (yikes, hardly a week away!) so your timing is perfect, thank you! Looking forward to trying some of these in the coming month!